When we bought the house it was clear that we need to renew the roof. The roof was built in the traditional manner, with terracotta tiles. Over many years water penetrated some beams, the rafters and walls and it was in disastrous condition. What we didn’t know was how should we repair it. So we asked several people, looked at several houses, searched the web with the result of being more confused at the end. to have it water proof. When looking at the roofs around us, we saw roofs covered in the traditional way with old or modern tiles and roofs covered with patterned Ethernit plates, looking like old tiles. 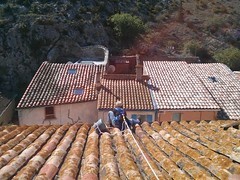 We already did a roof with traditional tiles few years ago and know how much work it is. Therefore we were captivated by the idea using Ethernit plates. I checked the material descriptions and ask at local DIY superstores for prices. All in all, it would have cost about 11,000 € on material for our roof of 88 qm! A bit discouraged, we reflected about the possibility to use our old tiles as this would reduce the costs dramatically. So we did! First, we untiled the smaller part of the roof, cleaned those tiles which were not broken and replaced an old, rotten beam, repaired another one and placed two new beam between them as the distance was too large. Also, we built a Mezzanine in 2.50 meters height to be used as storage later but also to be able to reach the roof from inside as the room all together is a bit more than 4.5 m high. On the smaller part of the roof we put new rafters on the beams and covered all with planks, a tar-bitumen foil and then replaced the tiles. 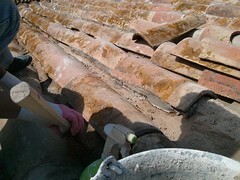 The bottom tiles we fixed with screws, the upper one’s with lime mortar. It took us about two weeks, interruptions because of heavy rain and wind caused some interruptions. Taking the tiles down, cleaning them, bring them up again, mix the mortar and bring it to the roof, place the tiles: we were exhausted and the outlook of having to do the bigger part of the roof was not really funny. After another heavy rain we looked closer to that part of the roof and it hasn’t got that many leaks than the other part, the beams were still o.k. and the tiles seemed to be not that old and in a very good condition. In parts it looked more like a seedbed so we cleaned it with a Karcher first and then reinforced the rafters, mortar the loose tiles and replace the broken ones’. Also we had to replace the dormer window and to remove the old chimney. In particular, I cemented about 500 of the 1.144 tiles. I was nearly living on the roof 😉 and I enjoyed it somehow. It was warm and sunny most the time and the view from there is just spectacular. A difficult part was the roof ridge as the two parts of the roof arrived in different heights now, so we had to be creative again: we placed a tailor cut plank in the middle and filled the interstices with lime mortar and protect it with lead. After, I cemented the ridge. The work was done just the day before it started raining again, and it is water proof! It was a lot of work, we spent a lot of time but saved a lot of money.